Well our first impressions of Bonaire have stayed true. We have really been having fun here. 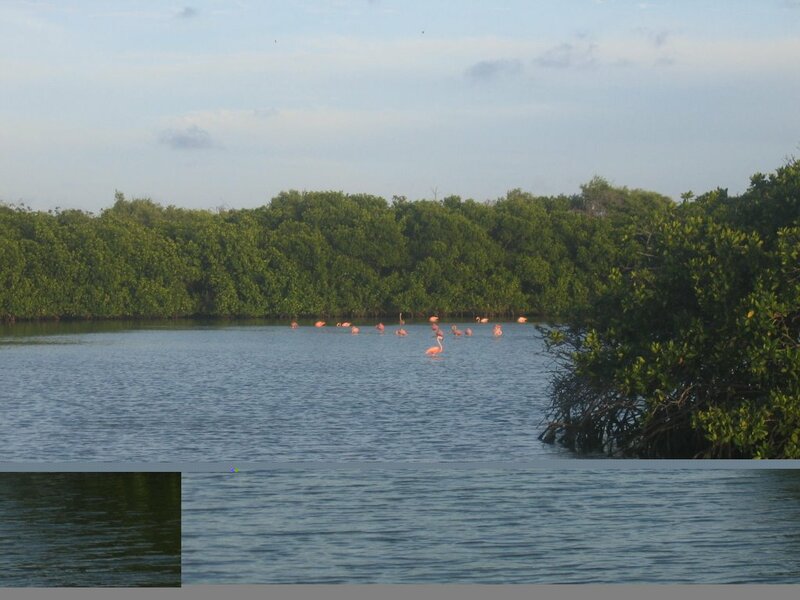 This island has everything in pink, from the airport tower to a beach to rumours of pink dolphins. On Sunday we rented a motorbike and toured the island, everyone we passed gave a smile and a wave. We stopped off on the way for some snorkeling on the west of the island then headed inland and saw amazing desolate lakes where the flamingoes feed and had a great lunch of conch and fish for just a few pounds. In the afternoon we went out to the east coast and watched the huge seas break on the shore - it�s amazing the amount of debris they bring, mostly plastic bottles - a real shame. I even had a go at riding the motorbike! 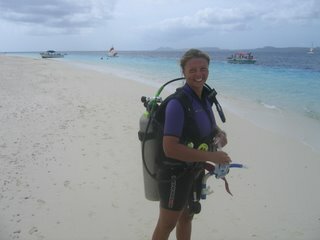 Monday we started our PADI open water diving course. It was a pretty intensive few days of diving and studying but we sat the exam on Thursday and did our final dive with our instructor and both passed so now we are divers. We have dived four times since and it gets better and better. We have seen the most amazing fish and coral. Yesterday a French Angel Fish swam right up to my mask and just stared, we think it was looking at it�s reflection. Then to make our day just as we were returning to R2 we spotted a turtle - he was right under R2 and we swam with him for a while - incredible! We have met some great people here - lots of boats have been here for ages diving and relaxing. There is a great little bar which has a happy hour every night where lots of people meet up. We met Laura and Glen from Turn One at the dive school and are trying to persuade them to head west with us but their dive boots are keeping them firmly fixed in Bonaire. Yesterday we met up with some of our old friends from the Canaries and had a BBQ on board Pelican with Vincent, Iris, River & Roxie and Sandy & Joan from Zeffrin. Some 80 hours after leaving Martinique we arrived in Kralendijk the capital of Bonaire - 460 nautical miles. We had nice winds to bring us down here but the seas were really lumpy and confused, which made getting any rest quite difficult, but when we saw our first glimpse of Bonaire it was all forgotten. 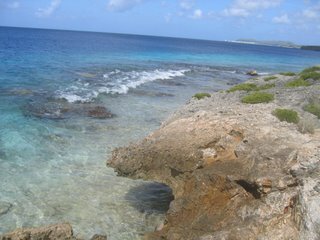 The south of the island is barely above sea level fringed by the whitest sand and then a turquoise strip of the clearest water. Unfortunately we couldn't see much more as there was heavy dust from Africa in the air limiting our visibility. We turned the corner to sail up the leeward coast and the winds built across the low land. We sailed right on the wind all the way up the coast really close in storming along - it was wild and the first time we have sailed R2 like this in ages. We took a mooring as the water is too deep to anchor and the island is surrounded by coral which we don't want to damage. I jumped in the water and found coral and hundreds of amazingly coloured parrot fish gathered under R2 - we fed the fish and they went mad. We went ashore yesterday afternoon to clear in and have a look around. Bonaire is nicely developed, a little cheesy in the main town centre but just lovely with a quiet innocence about it. It is a diver's paradise with over 60 dive sites so we are going to see about doing a course or trial dive while we are here. 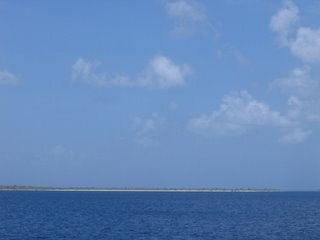 This morning the air is clear, the sky and sea are as blue as each other, we an see over to the island paradise of Klein Bonaire behind us - just got to go and explore! On the way down Andrew hooked a huge fish which stripped 300 metres of line off the reel before we could stop the boat, after a short but energetic fight the wire trace on the lure snapped and he was free. The game fish here grow to over 500 pounds so we were probably a little optimistic with our 100 pound set up but we'll keep trying. We arrived in Des Saintes as planned and found a beautiful group of islands. Unfortunately, so had half the boats in the world so it wasn't quite the secluded paradise we had hoped for but nevertheless had a nice time exploring the main town (about the size of a small village in the UK). It was really very 'French' we almost felt like we had left the Caribbean if it wasn't for the weather. The place was so busy we decided to leave earlier than planned and head to Dominica just 20 miles away. We arrived in Dominica early evening on 6 March. We were a bit nervous as the books we have say to be wary of 'boat boys' and crime in Dominica. As we approached the anchorage a small fishing boat zoomed towards us and we agreed our strategy. We were greeted by a chap with a big smile who just said 'welcome to Dominica my name's David and if you need anything while you are here just call me on the VHF' then off he zoomed - we were really pleasantly surprised. We spent a lovely night in Prince Rupert bay, before heading further south as we wanted to leave the boat on a buoy and explore ashore. We arrived in Roseau, the capital of Dominica and met Pancho (also known as Poncho, Pinko, Panko on R2). Pancho found us a buoy and took us to clear in his very fast boat as the customs dock was a fair way away. We then went to explore Roseau a little, before Pancho picked us up and whizzed us back. Roseau was a little poorer than other towns we have seen but the people were just lovely and all said good afternoon to us, we met a couple of great guys who were building chairs and they chatted to us for ages. The next day we got on our hiking boots and ventured inland. We tried to get a bus to some waterfalls but unfortunately a cruise ship was in so all the buses had become taxi's for the day. So we decided to walk and see if we could find a bus, we met more lovely people as we walked and were stopped by Julius who offered us a lift, after a bit of bartering we agreed a price and off we went. We are not sure what Julius was supposed to be doing that day but in the end he took us on a tour and we paid him about the equivalent of 20 GBP for the day. We went to the amazing Trafalgar Falls which are two falls, one hot and one cold. We found the spot where they meet down stream a little and swam in a pool that was hot on one side and cold on the other - really amazing. We then headed to the mountains to a huge fresh water lake, where we hiked and saw amazing birds, plants and trees. Julius hiked with us but he really was not expecting us to want to go quite so far and it really was very hot - poor chap! Dominica was really out of this world, by far the most beautiful island we have seen, really lush and green with mountains and valleys that take your breath away (as did the roads). But no time to stop as we were off to Martinique to meet our lovely friends Talara & Bob on Imaginess. We had an early start and then great sail down to Fort de France, the capital of Martinique, where they were anchored and pulled in just after lunch. It was great to catch up with them and we hung out together for a few days in a very swirly, rolly anchorage. Last night we said our goodbyes and this-morning they headed north and we are heading west again. We are sailing in the direction of Bonnaire which is in the south west Carribean, part of the Netherlands Antilles. The passage should take about 4 days so we hope to arrive for the weekend all being well. At the moment it's all a bit rolly and we are having to find our sea legs again, it is strange to be out of sight of land once again. Hopefully we'll do better on the fishing front on this trip as I'm still waiting for that Tuna. Yes folks, you may not believe it, but as much as we love Antigua we have finally left! Friday morning we said good bye to our friends Derrick & Louis on sister ship to R2, Aldebarran II (A2 maybe?!) after they replenished our stores as A2 was being lifted out. We checked out of Jolly Harbour and Antigua and made the big step to the anchorage just outside. We had a fantastic evening with an amazing sunset followed by a few two many rums with Matt & Tracey from Helene and Larry from Kokopelli on board R2. Saturday morning a little worse for wear we pulled out and started our trip south. 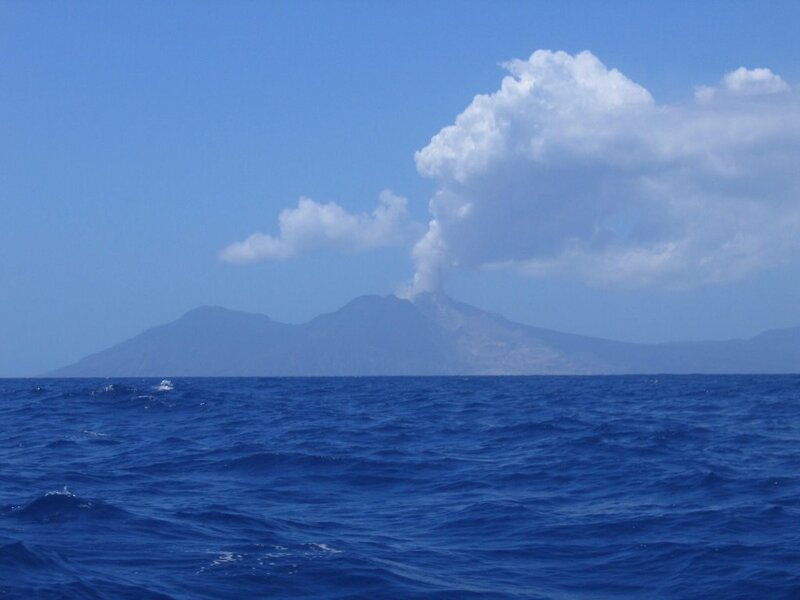 We heard on the radio that the volcano on Monserrat, which is just off the west coast of Antigua, was having a little eruption. So we sailed out towards the island to take a closer look (not too close though). It was amazing - smoke and ash pouring out the top of the crater. 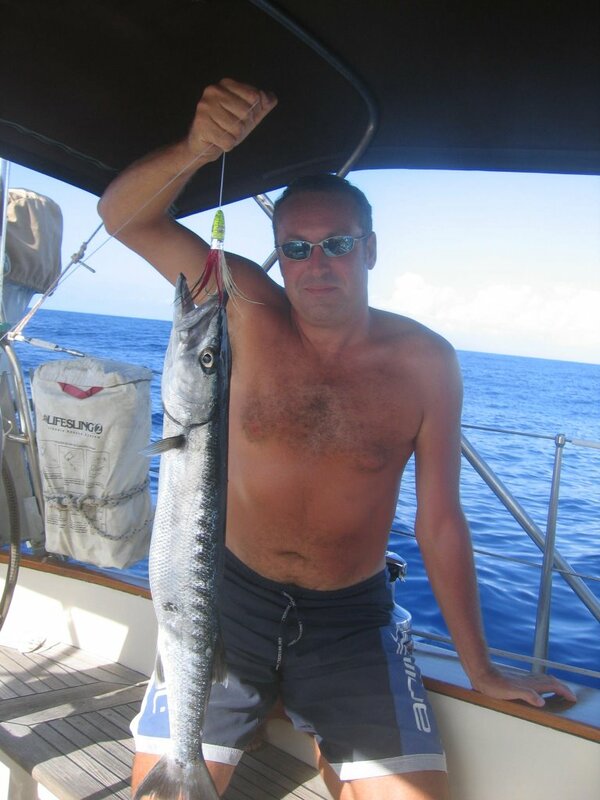 We then turned south and headed to Guadeloupe, catching a nice Barracuda on the way which we returned because they are frequently poisonous. We arrived in a little town called Deshailes late yesterday afternoon avoiding customs and immigration for the evening as checking in and out wasn't going to be a pain. Deshailes is a real mix of France and Caribbean absolutely beautiful and very different to the places we went to in Antigua. Swimming and snorkelling in Deshailes was lovely as the water was so clear, in Antigua the water was quite cloudy due to limestone so you could rarely see much. No time to stop though and another early start today as we are now on passage down the west coast of Guadeloupe to a group of Islands called Des Saintes. Our journey got off to an interesting start this morning when half an hour out the engine overheated. There was absolutely no wind and the sea was like a mill pond. Luckily Andrew noticed the temperature gauge was right up before the engine stopped and luckily again he had bought the hose that had gone in Palma in the summer. He thought it looked like it might be on the way out. So Andrew set about repairing the engine while I sat watch - he got the short straw as I had dolphins come to visit and the gorgeous coast of Guadeloupe to look at and he had to work on a steaming hot engine on an already scorching day. Anyway, half an hour later and we were on our way again. We hope to spend the next couple of days around Des Saintes before moving on to Dominica and then to Martinique to meet up with our friends on Imaginess.